Col. Chris Richie, a longtime Aviation Command and Control officer with the U.S. Marine Corps, will speak on America's national security strategies and vital national interests. He will discuss instruments of national power such as diplomacy, information, the military, and economics, and how these tools are tied to foreign military sales. Col. Richie will also share experiences living with his family in the United Arab Emirates. During a career spanning 25 years, Col. Richie has served in 17 countries and played an important role in a number of efforts supporting U.S. national security interests. From 2012-2014, while serving with the Military Liaison Office for the U.S. Embassy in the United Arab Emirates, Col. Richie oversaw a $19 billion foreign military sales program and was involved with numerous U.S. Central Command activities. He also led efforts for the first Joint Military Dialogue between the UAE and United States. 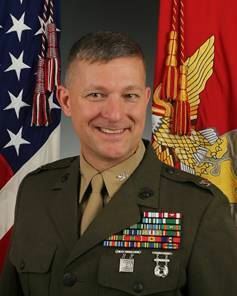 Col. Richie currently serves as the Assistant Chief of Staff for Marine Corps Installations West, Camp Pendleton, with responsibility for Government and Regional external affairs.